Because so many people take time off over the holidays, as a freelance journalist I’ve found that taking the week off between Christmas Eve & New Years it is a convenient time for most of my clients and it gives Judy, who watches Parker each day while I work, a much deserved break that is long enough for her to visit her family who mostly live in western South Dakota. The staycation with Parker has been so much fun AND I’ve realized that my creative juices have really been flowing into some holiday crafts since my brain hasn’t been busy with work. 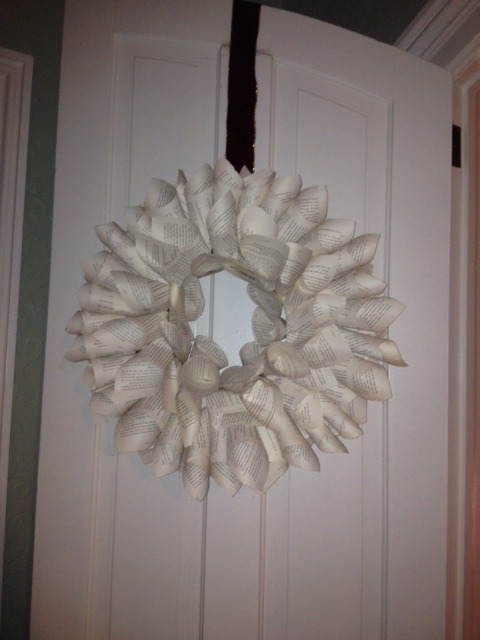 I made a Pintrest inspired book-page wreath – super easy and because I bought the paperback I used, the ribbon and wreath foam at a thrift shop, my entire project cost about $2 – plus I had left over supplies to send home with a friend! 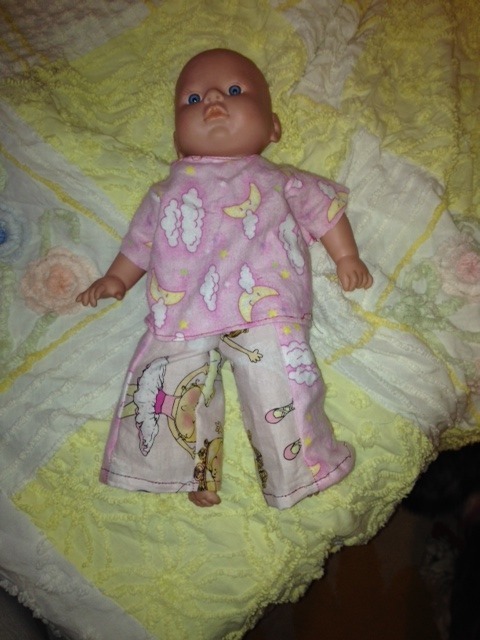 Then I made Parker’s baby doll – Abby – Christmas PJs to match the night gown I made Parker earlier this month. It was fun to exercise my crafty muscles over break and I hope to do more in 2014! The weekend before Christmas, Shon, Parker and I have a tradition of antiquing. It’s a fun way to spend a day together and sometimes it’s during these trips that we find the perfect gift. We like to change things up each year and visit antique shops in small towns near Sioux Falls. This year we chose Lennox. The two shops we visited were really unique and the shop owners super great! In the basement of one antique shop we found both of Parker’s “Santa” gifts – a wrist watch and an airplane; and we found an unexpected gift for a friend of ours – old 78 records – the type that play on antique gramophones. I’d never really given them much thought, only I had just visited this friend’s home and she mentioned that only foreign records came with the antique gramophone she and her husband purchased in Spain a few years ago. They were only a $1 so I picked a few up and dropped them off before Christmas. I can’t wait to hear if they worked! 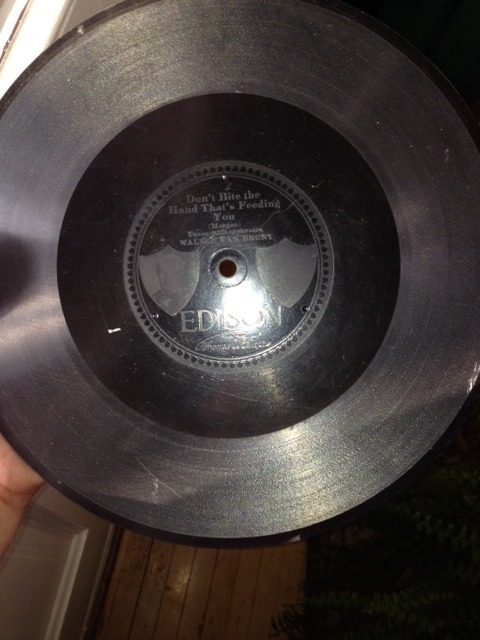 What I love is the way that Edison’s face is engraved in the center of the record. The other day we were digging through our game trunk to find an old favorite, Scribbage, and we ran across this old deck of playing cards that Shon picked up at a rummage sale this summer. Although the deck is typical, the artwork is not. 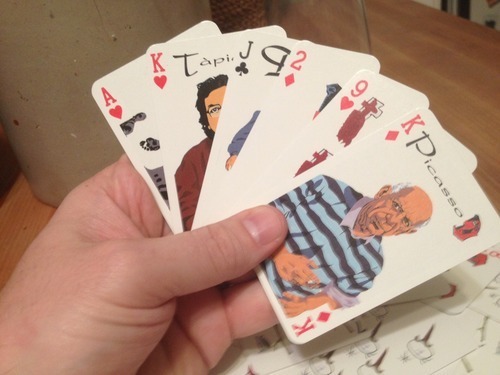 The deck’s motif is Spanish artwork and artists – Picasso, Dali, Miro and Tapies. It made for some fun Google searches.